Select screen size of your device. Select what photos you'd like to use. Select sorting rule of photos. According to your setting, photos will be displayed from top. Select size of each photo. "Custom" displays mixed sizes of photos. If this option is on, all photos are rounded and displayed as dots. Select spacing between photos. If "No" is selected, you can't specifly background color. 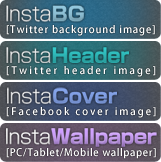 Specify background color. Selected color will be displayed in spaces. If theese options are on, they will be added to each photo.